Drawing on more than a decade of experience in the field of digital audio mixing, the Soundcraft Si Expression exploits some of the newest DSP, component technology and manufacturing techniques to deliver Soundcraft's most powerful cost effective digital console ever. Each console in the range is identical in its feature set so your only choice is how many faders and local mic amps you want. With a range covering the super portable 19" rack mount Expression 1 to the mighty Si Expression 3 with its 30+2 faders and 32 mic/line inputs there is a model to meet all needs. The Si Expression 1 features 16 recallable mic preamps, plus 4 line inputs, 4 internal stereo FX returns, AES in, and a 64x64 expansion slot offering more than enough scope to use every one of the 66 input processing channels. Every input processing channel has dedicated processing for high pass filter, input delay, gate, compressor and four band EQ while keeping it under control is a comprehensive automation system augmented with four mute groups and FaderGlow to light the way so you are never lost. All Si Expression consoles have busses, output processing and connectivity to match the versatility of the inputs; the 14 aux/group mixes can be configured as 14 mono mixes, 8 mono plus 6 stereo mixes or almost anything in between, while the 4 matrix mixes can be mono or stereo as needed. The bus and matrix mixes are complemented with four more mix busses dedicated to the internal Lexicon FX processors all in addition to the left, right and center busses. Each bus mix features a compressor, 4 band EQ, BSS graphic EQ and delay always available all of the time. Output connectivity is comprehensive with all models featuring 16 balanced line outputs, headphone monitor out, AES out and of course the 64x64 option slot. To complement the channel and bus processing all Si Expression consoles integrate four stereo Lexicon FX processors based on the MX400 providing a wealth of sounds, user adjustable parameters and dedicated tap-tempo keys. As the FX are hardware based, use of all the effects, even on the most demanding programmes does not affect other processing in any way and all dynamics, EQs, filters, delays, and GEQs remain available regardless what you are doing. Flexible onboard and expansion I/O options ensure your Si Expression integrates effortlessly with other system components utilising any of the Si series option cards including AES, Firewire/USB/ADAT, AVIOM, CobraNet, BSS Digital Audio Bus (BLU Link), Dante CAT5 or optical MADI. The MADI card, as well as being an interface to multi-track recording systems or plug-in systems like Waves, enables linking the Si Performer to any of the Soundcraft or Studer stageboxes to extend the I/O power and flexibility. Adding a stagebox to an Si Expression actually increases the number of channels you can mix at once not just how many inputs you have available to choose from! It is said ˜Power is nothing without control' and here the Si Expression excels with a comprehensive but 'simple to use' control surface incorporating a dedicated control for every parameter, a row of global mode encoders and colour touch screen ensuring operation is quick and easy. 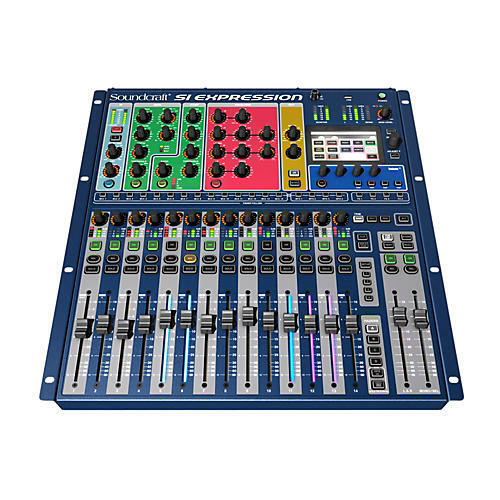 As you would expect from any Soundcraft digital mixer the facilities are extensive and include legendary audio quality courtesy of the latest generation EMMA DSP processor, the same DSP platform that has helped propel previous Soundcraft Si series consoles to fame. All this power united with reliability, flexibility and usability puts the Si Expression in a class of its own. Dimensions (WxDxH): 19" x 20.5" x 6.6"
Width with rack ears removed: 445mm/17.5"
Dimensions (WxDxH) . . . . . . . . . . .716mm/28.2" x 520mm/20.5" x 168mm/6.6"
Weight . . . . . . . . . . . . . . . . . . . . . . . . . . . . . . . . . . . . . . . . . . . . . .
Dimensions (WxDxH): 36.5" x 20.5" x 6.6"